Bystanders lifted a burning car off a motorcyclist trapped underneath. Home World U.S. News Bystanders lifted a burning car off a motorcyclist trapped underneath. 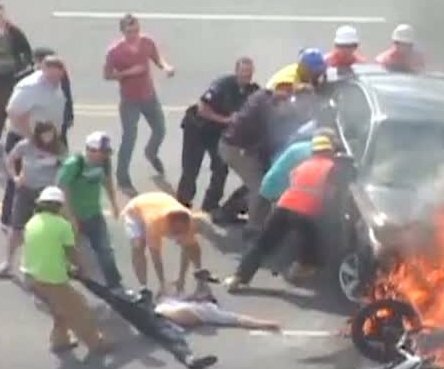 A crowd of bystanders lifted a burning car off a motorcyclist trapped underneath in a dramatic rescue near Utah State University on Monday. The good Samaritans action was captured on video. Chris Garff , who captured the event on video, said he was doing what any good videographer would do when he grabbed his camera and went to investigate the black smoke billowing outside the Logan, Utah, business building where he was preparing to videotape a lecture for a business professor. Then he realized he was capturing something extraordinary. “I knew there was some pretty remarkable footage,” he told The Times. Moments earlier, a motorcycle and a BMW had collided, leaving the motorcyclist trapped underneath the car; the motorcycle quickly went up in flames that spread to the front of the BMW. By the time Chris Garff started shooting from his perch on the ninth floor, a few bystanders had rushed over and frantically tried to lift the vehicle – but it wouldn’t budge. Then they tried again, including some nearby construction workers still wearing their hard hats. The crowd hoisted up the side of the car so that it was resting on just two wheels. That created just enough space for one of the construction workers to dart underneath and pull the man’s seemingly lifeless body to safety. Chris Garff said he continued to roll and tried to figure out what to do next and then he realized the man was moving. “I was just freaking out, you can hear my voice on the video, I thought that guy was a goner,” Chris Garff, 31, said. The man, later identified as Brandon Wright, 21, was taken to a local hospital in critical condition and treated for broken bones and other injuries. He faces a long recovery, and his family released a statement thanking the strangers who saved him. “Brandon and our entire family would like to express our deep gratitude to all of the people who stopped at the crash scene on Monday to help rescue Brandon,” the statement said. Chris Garff said he had to get back to work after the rescue – the media production specialist still had a lecture to shoot. But when class was over, he prepped the video and contacted local media to see if they might be interested. In less than 24 hours, the video has had more than 42,000 views on YouTube, and Chris Garff’s phone is ringing off the hook with interview requests from CNN and other media outlets. Chris Garff said he’s pleased with the attention, but he’s more pleased to know he lives in a world where strangers will put their lives in danger to help others. Insulin could slow Alzheimer's progression.